Spring is about to ... well, spring! At least in the Earth's Northern Hemisphere anyway. This year's official onset of spring will occur on March 20 at 2:58 p.m. PDT (5:58 p.m. EDT). Astronomers are fond of saying that the first day of spring is when the sun rises due east and sets due west and when the length of our day and night are equal. And if we don't concern ourselves with the fine details of our sun's position, those are both true statements. So why, then, do we often cite the time for the beginning of spring? That's because the beginning of spring is not a day but a moment in time. It's marked by the sun's passage in the heavens from the Southern Hemisphere sky into the Northern Hemisphere sky; in fact, it's the exact moment when the sun crosses the celestial equator on its journey from south to north. Confused? Well, try to picture what's going on in the heavens. During our wintertime, we in the Northern Hemisphere see the sun cross our daytime sky low in the south; in our summertime, it crosses high overhead. It's all caused by the fact that the Earth's axis is tilted and, as we orbit the sun, our wintertime sun shines more directly onto the Southern Hemisphere, while our summertime sun shines more directly onto the Northern Hemisphere. 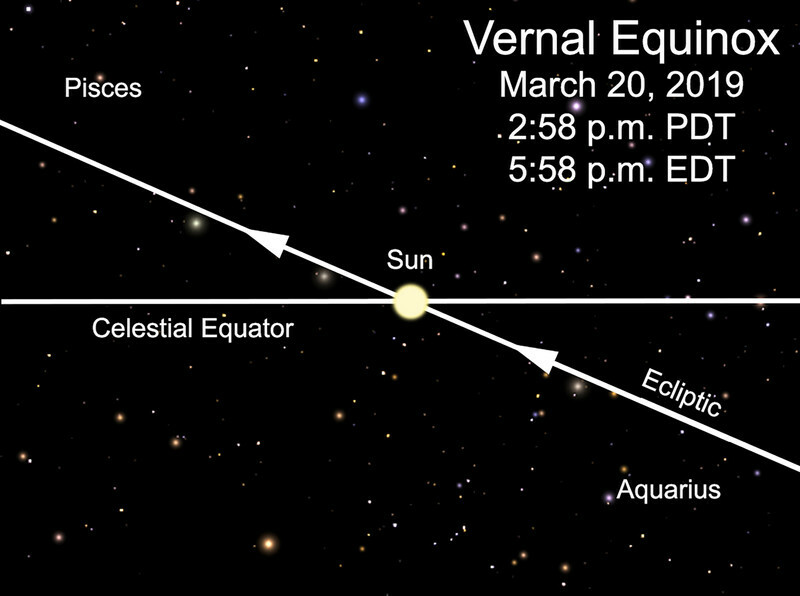 At some point during the year, the sun has to cross the equator on its way northward and that occurs at the moment known as the vernal equinox. On that day, our sun lies directly over the Earth's equator. Try to imagine standing on the Earth's equator on the first day of spring. You would see the sun pass directly overhead. A few days or weeks earlier, the sun would have appeared in your southern sky, and a few days or weeks later, it will appear in your northern sky. But on that day, the sun stands directly over the equator and would appear to pass directly overhead, and you would discover you have no shadow! 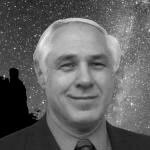 Another way of thinking about it is to imagine projecting the Earth's equator into the starry heavens around it. This would create a great circle in the sky that astronomers call the celestial equator. The moment when the sun crosses the celestial equator on its way north marks the vernal equinox and the onset of spring in the Earth's Northern Hemisphere. The night sky also exhibits changes due to the season. At this time of year, we begin to turn away from constellations such as Orion and Taurus — the so-called Northern Hemisphere "winter" stars — and begin to turn toward groupings like Ursa Major, the Great Bear (the Big Dipper makes up most of it); Leo, the lion; and Bootes, the herdsman. We know these as our springtime stars and, within a few months, tshey will completely replace those of winter. South of the Earth's equator, of course, all is reversed. Southern Hemisphere stargazers are now watching Orion, Taurus and friends (their summer sky) disappear in the west, while Leo, Bootes and company (their autumn constellations) rise in their eastern sky. The vernal equinox refers to the start of spring in the Northern Hemisphere.